In the future, maybe by the year 2010, our watches will be able to tell us when the next bus is coming. 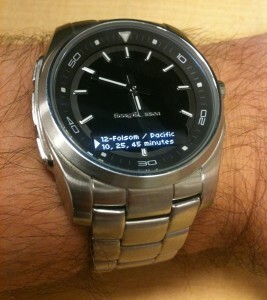 This is my Sony Ericsson MBW-150 bluetooth watch, showing the next few SF Muni bus arrival times for a nearby stop. The code to fetch the arrival times is running on my Droid phone, and communicating with the watch using Marcel Dopita’s OpenWatch software for the Android platform. Smart stuff by Joe Hughes.